HONEY AND HEMLOCK: Orthodox Theanthropic Culture: Whither Does Humanistic Culture Lead? What is the objective of Orthodox culture? It is to introduce and to realize, to the greatest extent possible, the Divine in man and in the world around him; to incarnate God in man and in the world, wherefore Orthodox culture is an incessant service to Christ our God, an incessant divine service. Man serves God by means of all creation; all around himself he systematically and regularly introduces that which is of God into his every effort, into his creativity. He awakens everything divine in nature around him, in order that all of nature, under man’s guidance, might serve God, and thus does all creation participate in a general and mutual divine service, for nature serves that man who serves God. Theanthropic culture transfigures man from within, and thereby likewise influences his external condition, – it transfigures the soul, and by way of the soul, it transfigures the body. For this culture, the body is the temple of the soul, which lives, moves and has its being through the soul. Take away the soul from the body, and what will remain, if not a stinking corpse? The God-man first of all transfigures the soul, and, subsequently, the body as well. The transfigured soul transfigures the body; it transfigures matter. It is through the podvig [struggle] of procuring the evangelical virtues that man acquires power and authority over himself and over nature around him. Banishing sin both from himself and from the world that surrounds him, man likewise banishes its savage, destructive, ruinous force; he fully transfigures himself and the world, and subdues nature, both within and without and about himself. The finest examples of this are the saints: having sanctified, having transfigured, themselves through the podvig of attaining to the evangelical virtues, they likewise sanctify and transform nature around about them. There are many saints who were served by wild beasts and who, simply by the mere fact of their appearance, could subdue and tame lions, bears and wolves. They treated nature prayerfully, mildly, meekly, compassionately, and gently; being neither harsh, nor stern, nor hostile, nor ferocious. It is not an external, violent, mechanical imposition thereof, but an inner, good-willed, personal assimilation of the Lord Jesus Christ through the podvig of the Christian virtues that establishes the Tsardom of God on earth, that establishes Orthodox culture - for the Kingdom of God does not come externally or visibly, but internally, spiritually, imperceptibly. The Saviour says: ”The Kingdom of God shall not come perceptibly. And they shall not say: ‘lo, it is here,’ or ‘lo, it is there.’ For behold, the Kingdom of God is within you” (Luke 17:20-21). It is within the God-created and God-like soul, sanctified by the Holy Spirit, for ”The Kingdom of God is not food nor drink, but righteousness and peace and joy in the Holy Spirit" (Rom. 14:17). Yes, in the Holy Spirit, and not in the spirit of man. It can be in the spirit of man to the extent that man infills himself with the Holy Spirit by means of the evangelical virtues. 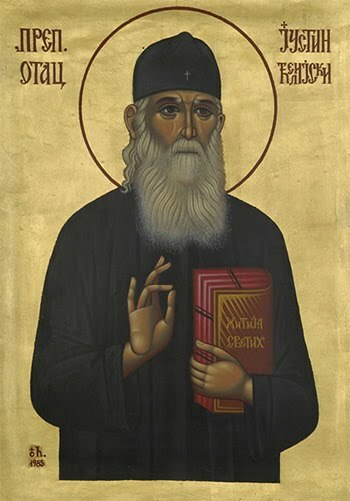 Wherefore the very first and very greatest commandment of Orthodox culture is: ”Seek ye first the Kingdom of God and of His righteousness, and all this shall be added unto you” (Matt. 6:33). That is, everything will be added unto you which is needful for supporting the life of the body: food, clothing, shelter (Matt. 6:25-32). All these things are but the appurtenances of the Kingdom of God, yet Western culture seeks these appurtenances first of all. Therein is its paganism to be found; for, in the words of the Saviour, it is the pagans who seek these appurtenances first of all. Therein is its tragedy, for it has starved the soul in its concern for material things, whereas the sinless Lord has stated once and for all: ”Do not be concerned for your life, for what ye shall eat or drink, nor for your body, what ye shall wear, because it is the pagans who seek all these things, and because your Heavenly Father knoweth that ye have need of all this. Seek ye first the Kingdom of God and His righteousness, and all this shall be added unto you” (Matt. 6:25, 32-33; Luke 12:22-31). Great is the extent of those necessities which modern man passionately creates in his imagination. In order to satisfy these senseless needs men have turned our wondrous Divine planet into a slaughterhouse. But our philanthropic Lord has long since revealed what is “the one thing needful” for each man and for all of humanity. And what is this? The God-man Jesus Christ and everything that He brings with Him: divine truth, divine justice, divine love, divine goodness, divine holiness, divine immortality and eternity, and all the other divine perfections. That is “the one thing needful” for man and for humanity, and all the rest of man’s necessities, in comparison with this, are so insignificant, that they are almost unneeded (Luke 10:42). When man seriously, and in accordance with the Gospel, contemplates the mystery of his own life and of the life around him, then he must, of necessity, conclude that the most pressing need is to reject all necessities and to follow decisively after the Lord Jesus Christ, to unite with Him by way of perfecting the evangelical podvigs. Without having done this, man remains spiritually unfruitful, senseless, lifeless; his soul dries up, crumbles away, disintegrates, and he gradually grows insensate, until such time as he finally dies completely, for the Divine lips of Christ did say: “Abide ye in Me, and I in you. As a branch cannot bring forth fruit of itself, unless it be on the vine: so also you, unless ye be in Me. I am the vine and ye are the branches, he who abideth in Me, and I in him, the same bringeth forth much fruit; for without Me ye can do nothing. He who abideth not in Me shall be cast out, like a branch, and shall wither up, but such branches are gathered and cast into the fire, and they are consumed” (John 15:4-6). It is only by means of a spiritually organic unity with the God-man Christ that man can continue on his life into life eternal and his being into one of eternal existence. A man of Theanthropic culture is never alone: when he thinks he thinks through Christ, when he acts he acts through Christ, when he feels he feels through Christ. In a word: he incessantly lives through Christ-God, for what is man without God? At first, half a man, and in the end, no man at all. It is only in the God-man that man finds the completeness and perfection of his own being, his Prototype, his perpetuity, his immortality and eternity, his absolute worth. The Lord Jesus Christ, alone among men and all beings, proclaimed the human soul to be the greatest treasure of all worlds, of those both above and below. “Therefore, fear them not: for there is nothing concealed that shall not be revealed, nor secret which shall not be made known” (Matt. 10:26). All the stars and planets are not worth a single soul. If a man wastes away his soul in sins and vices, he will not be able to redeem it, even were he to become master of all the stellar systems. Here man has but one way out - the God-man Christ - Who is the only One Who grants immortality to the human soul. The soul is not freed from death by material things, but enslaved; and it is only the God-man Who frees man from their tyranny. Material things have no power over the man who belongs to Christ; rather, he has power over them. He sets the true value of all things, for he values them in the same way as did Christ. And whereas the human soul, according to the Gospel of Christ, has an incomparably greater worth than all the beings and all the things in the world, Orthodox culture is therefore primarily a culture of the soul. Man’s greatness is only in God, that is the motto of Theanthropic culture. Man without God is 70 kg of bloody clay, a sepulchre prior to the grave. European man has condemned to death both God and the soul, but has he not thereby also condemned himself to that death following which there is no resurrection? Try dispassionately to grasp the essence of European philosophy, of European science, politics, culture, civilization, and you will see that in European man they have killed God and the immortality of the soul. And if one seriously ponders the tragedy of human history, then it is possible to see that Deicide always ends with suicide. Remember Judas: first he killed God, and then he destroyed himself, such is the inevitable law of the history of our planet. The structure of European culture, erected without Christ, must crumble away, crumble away very quickly, prophesied the insightful and astute Dostoevski 100 years ago, and the mournful Gogol over 100 years ago. And before our very eyes are the prognostications of the Slavonic prophets coming to pass. For ten centuries has the European Tower of Babel been building, and now a tragic picture meets our gaze: what has been constructed is a huge nothing! General perplexity and confusion have begun: man cannot understand man, nor soul-soul, nor nation-nation. Man has risen up against man, kingdom against kingdom, nation against nation, and even continent against continent. European man has reached his destiny-determining and head-spinning heights. He has set the superman at the summit of his Tower of Babel, seeking therewith to crown his structure, but the superman went mad just short of the apex and fell from the tower, which is crumbling away and collapsing in his wake, and being broken down by wars and revolutions. Homo europaeicus had to become a suicide. His “Wille zur Macht” (Lust for Power) became “Wille zur Nacht” (Lust for Night). And Night, a burdensome Night, descended upon Europe. The idols of Europe are crashing down, and not far distant is that day when not a stone will remain upon a stone of European culture, that culture which builds cities and destroys souls; which deifies creatures and casts away the Creator. The heavens are empty, there is no God in them; the earth is empty, there is no immortal soul upon it. European culture has turned all its slaves into corpses and has itself become a graveyard. “I want to journey to Europe,” says Dostoevski, “and I know that I am going to a graveyard” (F. M. Dostoevski, Winter Notes On Summer Impressions). Prior to the First World War, Europe’s impending perdition was sensed and foretold only by melancholic Slavonic seers. Following it, some Europeans also take notice of and sense this. The boldest and most sincere of them, doubtless, was [Oswald] Spengler, who shook the world with his book The Decline of the West. In it, through all the means that European science, philosophy, politics, technology, art, religion, etc., could provide him, he shows that the West is perishing. Ever since the First World War, Europe is emitting her pre-mortem death-rattle. Western or Faustian culture, which according to Spengler had its origins in the tenth century, now is passing away and crumbling down, and is destined to perish completely in the twenty-second century (at present it would seem that this process has become accelerated.). In the wake of European culture, Spengler foresees the coming of the culture of Dostoevski, the culture of Orthodoxy. Doubtless, the principles of European culture and civilization are theomachic. Long was the type of European man in his becoming what he is, until such a time as he replaced the God-man Christ with his philosophy and science, with his politics and technology, with his religion and ethics. Europe made use of Christ “merely as a bridge from uncultured barbarism to cultured barbarism; that is, from a guileless barbarism into a sly barbarism” (Bp. Nikolai Velimirovich, A Sermon On Everyman). In my conclusions about European culture there is much that is catastrophic, but let this not astonish you, for we are speaking about the most catastrophic period of human history - the apocalypse of Europe, the body and spirit of which are being rent asunder by horrors. Without a doubt, volcanic contradictions are implanted in Europe, the which, if they are not removed, can be resolved only by the final destruction of European culture.